The life story of the most famous person who has ever lived is, in fact, filled with a mysterious gaping hole. From the age of 13 to 29 there is no Biblical, Western, or Middle Eastern record of Jesus's whereabouts or activities in Palestine. Known as “The Lost Years,” this gaping hole remained a mystery until one explorer's remarkable discovery in 1887. The discovery of Jesus's time in India lines up perfectly with The Lost Years of Jesus, as well as with the degree of significance of his birth in the Middle East. When a great Buddhist, or Holy Man (i.e. Lama), dies, wise men consult the stars and other omens and set off — often on extraordinarily long journeys — to find the infant who is the reincarnation of the Lama. When the child is old enough he is taken away from his parents and educated in the Buddhist faith. Experts speculate that this is the foundational origin of the story of the Three Wise Men, and it is now believed Jesus was taken to India at 13 and taught as a Buddhist. At the time, Buddhism was already a 500-year-old religion and Christianity, of course, had not even begun. 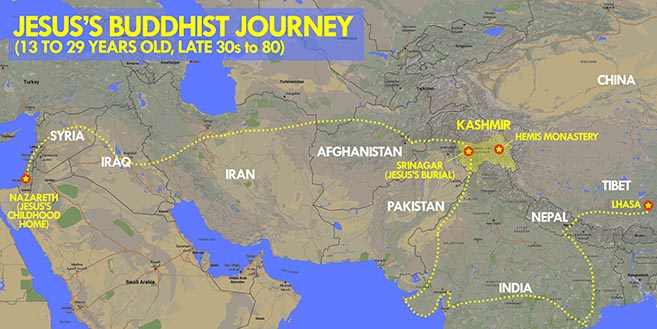 “Jesus is said to have visited our land and Kashmir to study Buddhism. He was inspired by the laws and wisdom of Buddha,” a senior lama of the Hemis monastery told the IANS news agency. The head of the Drukpa Buddhist sect, Gwalyang Drukpa, who heads the Hemis monastery, also confirms the story. The 224 verses have since been documented by others, including Russian philosopher and scientist, Nicholas Roerich, who in 1952 recorded accounts of Jesus's time at the monastery. “Jesus passed his time in several ancient cities of India such as Benares or Varanasi. Everyone loved him because Issa dwelt in peace with the Vaishyas and Shudras whom he instructed and helped,” writes Roerich. 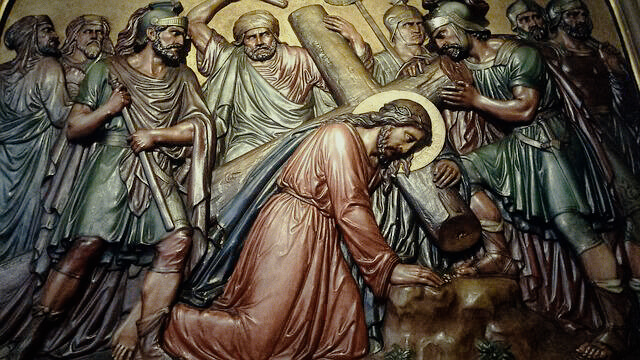 Jesus spent some time teaching in the ancient holy cities of Jagannath (Puri), Benares (in Uttar Pradesh), and Rajagriha (in Bihar), which provoked the Brahmins to excommunicate him which forced him to flee to the Himalayas where he spent another six years studying Buddhism. German scholar, Holger Kersten, also writes of the early years of Jesus in India in the book Jesus Lived In India. “The lad arrives in a region of the Sindh (along the river Indus) in the company of merchants,” writes Kersten. “He settled among the Aryans with the intention of perfecting himself and learning from the laws of the great Buddha. He travelled extensively through the land of the five rivers (Punjab), stayed briefly with the Jains before proceeding to Jagannath.” And in the BBC documentary, Jesus Was A Buddhist Monk, experts theorize that Jesus escaped his crucifixion, and in his mid-late 30s he returned to the land he loved so much. He not only escaped death, but he also visited with the Jewish settlers in Afghanistan who had escaped similar tyranny of the Jewish emperor Nebuchadnezzar. Locals confirm that Jesus spent the next several years in the Kashmir Valley where he lived happily until his death at 80-years-old. With sixteen years of his youth spent in the region, as well as approximately his last 45, that means Jesus spent a total of roughy 61 to 65 years of his life in India, Tibet, and the neighboring area. Locals believe he is buried at the Roza Bal shrine at Srinagar in India-controlled Kashmir. The BBC visited the shrine and you can read about what they found HERE.